Chroma 58182 LED Light Bar Test System is a fully automatic test system able to measure the top-view/side-view light bar uniformity composed of white light. With an image recognition function, it can accurately capture the location, and identify the center of LEDs being measured. With automatic mechanical and optical measurement function, the 58182 can perform extremely accurate optical and electrical measurement. 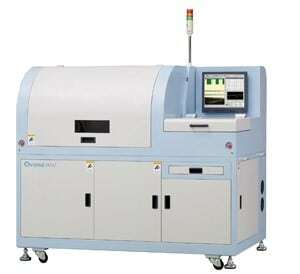 The 58182 integrates image recognition function, automatic mechanical and optical measurement. It can not only improve the yield rate by sifting out the defect products, but also reduce the product verification time and development cost. In addition, the 58182 has a flexible measurement platform to adapt different type of top-view / side-view LED light bar measurement, and friendly user interface to reduce user’s learning time. Consequently, the 58182 is the best choice for testing top-view/side-view light bar.